This article describes four levels or stages of Personal Growth -- social accomplishment, psychological growth, spiritual progress and transformation. It explains the distinctions between them and the methods or types of changes of characteristics of each level. Other articles on this site present specific strategies and methods for making progress at each of the four stages. The past half-century of growing prosperity and the progressive emergence of individuality have led more and more people to express interest in self-development rather than the exclusive pursuit of material and social achievement. Thus, usage of the terms personal growth, psychological growth and spiritual progress have become increasingly common, although there is little agreement regarding the actual meaning of these words. In fact, human beings have always been growing personally or psychologically, even those who are almost entirely absorbed in struggling for material survival or aspiring for higher social achievements. But that growth has been most often subconscious, as a result of the trials and errors of life experience, rather than as a result of a conscious process of self-development. A conscious effort at developing our personalities requires a clear conception of what personality is and how it can be altered. While we are all fairly clear about what constitutes a normal healthy and comfortable social existence, when it comes to psychological and spiritual progress there is a great deal of confusion. What does it mean to grow psychologically? What does it mean to progress spiritually? By psychological growth, some people mean they want greater freedom to do what they want, pursue their interests and live as they want. Others want to understand themselves better, develop personal capacities, and experience new things. Some want to search within themselves for some deeper, truer self or psyche. So too, spiritual growth means a great many different things to different people : to be of service to others, pray, meditate, acquire healing powers, read and understand philosophic and religious texts. Others want direct spiritual experience : to expand their consciousness, feel the reality of God, commune with the universe, discover their souls or realize a higher state of knowledge and bliss. A real science of humanity needs to define and explain these concepts which are so central to the aspirations of millions of people. Some of these dimensions naturally increase during our lifetimes as a result of life experience and conscious effort. Some of them lend themselves to change by a serious psychological effort. Some can be altered only by spiritual experience. 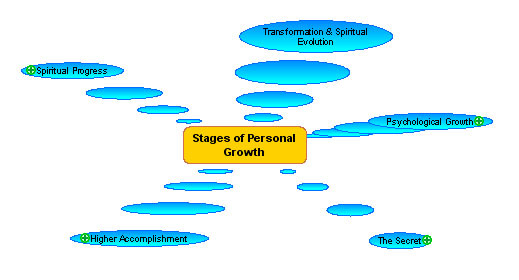 Therefore, those interested in personal growth need first of all to be clear about the differences between these four aspects of personality and the methods appropriate for personal growth at each of these levels. An effective approach to understanding human personality requires a clear distinction between those dimensions that lend themselves to alteration by mental or physical effort, deeper elements that can be changed only by a deeper psychological effort or by the influence of higher (spiritual) consciousness, and those that are virtually fixed for the span of life and can only be altered by yogic transformation. Social accomplishment refers to our capacity as an individual to survive, function effectively in relation to other people, and successfully carry out activities in society to fulfill personal goals : to acquire education, find employment, become financially self-sufficient or prosperous, establish a family, gain social acceptance or higher status, etc. Life experience increases our capacity for social accomplishment. We acquire greater knowledge and skill through education and training. We learn from our experiences and thereby enhance our capacity for accomplishment in life. The capacity for social accomplishment is determined by the overall development of the personality. The actual level of social accomplishment depends to a large extent on personal effort. By greater effort we become capable of doing better or more than before. We can expand our knowledge or enhance our physical, social and mental skills. We can train ourselves to run faster, jump higher, play a musical instrument, read faster, explain ourselves more effectively, etc. These changes help us more fully and effectively utilizes the developed capacities of our personality for higher social accomplishment. If we want to raise our accomplishment beyond this level, we need to expand our personality, which is what we mean by psychological growth. Greater mental interest and vital enthusiasm. We can study to acquire greater knowledge. We can seek training to enhance our skills. We can increase our commitment to Personal values and Work values. We can become cleaner, more orderly, regular and punctual. We can more effectively organize our lives and work. We can become more systematic and coordinate our efforts better with other people. We can also take a conscious effort to be more interested, enthusiastic and energetic in pursuit of our goals. All these types of efforts help us to accomplish more by growth of personality. The first level of personal growth involves growth in our external behavior. The second level of personal growth requires a psychological change in our attitudes and values. Psychological growth refers to a qualitative change in the nature of the personality that can be brought about by conscious intention and effort. This psychological change also enhances our capacity for social accomplishment, but it does so by expanding the personality, not just by greater external effort. Psychological growth may also be described as a qualitative improvement in those attributes that make an individual what can be regarded as a 'better' and more enlightened person, expressing higher values and capable of making a greater contribution to the overall welfare and well-being of society. Many people mistake psychological growth with greater freedom to do what we want, greater capacity to assert ourselves and live for ourselves. But these things are really expressions of the vital’s desire to make itself happy by greater self-indulgence. They do not result in lasting happiness and do not make us better people. Psychological growth requires an effort to acquire greater self-knowledge and self-control, to master our natural impulses and direct our energies into something better and higher. If you compile a list of those human beings who have been most admired and respected, you can easily identify the characteristics associated with psychological growth – living for an ideal, courage of conviction, willingness to take risks, integrity, kindness, generosity, service toward others, etc. We are more self-reliant: We rely more on ourselves, rather than expecting other people to do things for us. We are more responsible: We feel more personally responsible for the people around us or the work in which we are involved, rather than depending on others and blaming them for what goes wrong. We aspire for higher achievements: We are no longer satisfied with being secure or comfortable or gaining the acceptance and recognition of those around us. We want to live for something more than mere survival or social acceptance. We want to contribute. We have higher standards: We are not satisfied being as good or doing as well as other people or getting their approval. We strive for something more than mere acceptance or social approval. We are more positive: We react less against other people and no longer think ourselves superior to others or feel jealous of those who achieve more than we do. We do not try to dominate others or impose our will on them. We are more generous, gracious, and willing to give ourselves to other people, rather than demanding anything from them. We live higher values: We respect others more, our thoughts are more objective, our words are more truthful, our acts are more honest and our relationships are more harmonious. We act according to our understanding rather than our impulses: We do what we know to be right rather than what we feel like doing or find convenient. We are no longer carried away by our passions, impulses or preferences. We reflect more on our own behavior to understand ourselves better. We reflect more on other’s behavior to see their point of view and become more tolerant. Changes of this type are difficult to bring about and make permanent. They involve significant psychological effort and constitute real growth of personality. Relatively few people make the effort consciously. Human Science is based on the premise that there is a spiritual dimension to reality which is the foundation and creative source of all that exists and that a progressive evolution in consciousness makes it possible for human beings to experience and express this spiritual dimension in their personal lives. The varieties of spiritual experience are very great. They vary in form, direction, depth, height, intensity and permanency. They include such experiences as cosmic consciousness, a concrete sense of oneness with other beings, awareness of an infinite emptiness or void beyond the manifest universe, discovery of one’s soul or psychic being, realization of a transcendent Spirit or Conscious Being, contact with godheads from what Sri Aurobindo refers to as the Overmental plane, direct knowledge from the Supramental plane of Truth Consciousness, etc. The term spiritual experience is often used or confused with any type of experience on the subtle or occult planes of existence that are not normally accessible to our external consciousness – experiences of subtle beings and forces that influence our lives, of occult powers, of subtle sounds, visions, voices, etc. In this article, we reserve the term spiritual only for those powers and experiences that come from the higher spiritual planes of consciousness. Experiences from these planes are universally associated with spiritual qualities such as patience, peace, silence, equality (equanimity, non-reaction), harmony, self-giving, truth, freedom, light, and compassion. Spiritual experience makes us more aware of our oneness with other people. It helps us escape from the confines of our ego and see the world and other people through their eyes and from their point of view. Broadly speaking, progress that enhances the presence and expression of any or all of these qualities in the personality and life of a person may be regarded as forms of spiritual progress. Patience: We are more patient and tolerant. Peace: We feel more calm and peaceful, even in the midst of other people and intensity activity. Silence: Our minds become settled. Thoughts are no longer insistent. We may even experience periods in which the mind is completely still. Equality: We do not react to disturbing events. We are capable of greater equanimity. We have the capacity to remain undisturbed without being indifferent. Knowledge: We understand the significance of all experiences that come to us and know how to grow or outgrow the need for them. Goodwill: We rejoice in the joy of others. We no longer feel jealous, resentment or competition with others. Self-giving: We identify with others and aspire for their fulfillment more than for our own. Spiritual experience can greatly enhance our capacity for accomplishment, positive personal relations and personal fulfillment. It can give us a deep sense of inner strength and security, a faith in life and trust in the spirit. Except in rare instances spiritual experience cannot alter the very substance or structure of the personality. Western psychologists generally agree that human character cannot be changed. It is inherited and fixed for life. According to Eastern spiritual tradition, that form or structure, known in Sanskrit as swarupa, is the form which the soul has taken for birth during this lifetime and it remains unchanged through all experiences of this birth. This is also the source of what Hindus refer to as karma. This factor is extremely difficult to describe or measure, but differences in the size and intensity of personality can be readily perceived in some instances, especially when one is in the presence of a towering personality such as a Napoleon, a Goethe, a Churchill, or a Gandhi. Every individual has their own characteristic level of intensity which is distinct from the vital or mental energy that they express and may best be represented by their overall capacity to change or influence the people with whom they relate and the environment within which they live. We have referred elsewhere to several stages in the formation of personality under the terms Manners-Behavior-Character-Personality-Individuality. There are people such as Lydia Bennet and Mrs. Bennet in Pride & Prejudice who have not yet developed the self-control and maturity needed even for reasonably good manners and are very unlikely to do so, regardless of their upbringing. Their very nerves are not yet capable of that discipline. Others acquire perfect external manners, such as the teachers and students in Mona Lisa Smile, but how they behave outwardly does not really reflect how they think and feel inside. Still others, such as Jane Bennet in Pride & Prejudice, have achieved a level in which their inner feelings are fully in accord with their external manners. They truly mean and feel what they say, but the form of their personalities is largely determined by the social norms and standards of the society in which they were raised. Still others have a formed character that is capable of higher accomplishment, such as Darcy in Pride & Prejudice. Then there are a few at the level of personality and true individuality who have developed to the point where they can transcend the limitations imposed by society and their own upbringing. Mikhail Gorbachev exhibited real personality in undermining the monopoly on power of the political party and government which he headed. This factor refers to the relative development of the three different centers of consciousness in human beings which is discussed at length in Physical, Vital, Mental and Nine Levels. It is this factor which makes us classify a person as a thinker, a dynamic man of action, a leader of people, an organizer, a loyal follower, a courageous patriot or sensitive artist. While we can consciously strive to express more of the higher consciousness with which we are endowed, except by spiritual change the relative blend and balance of these three elements in our personality cannot be significantly altered. William Collins may become a wealthy landlord but he can never become a perceptive thinker like Mr. Bennet. Mary Bennet may become well-read and well-trained but she can never develop the mental acuity and emotional depth of her sister Elizabeth. According to Sri Aurobindo, even character and karma can be altered by the descent of the supramental force into the human personality. But this is an extraordinary spiritual accomplishment that lies far beyond the scope of psychological growth in the realm of spiritual transformation. Our minds tend to think in linear fashion. For the mind, progress is to move from one point on a line to another point further along or higher up. But human personality and consciousness are not simple. We consist of more than one dimension. Progress for us cannot be reduced to any single dimension or direction. A more helpful conception is to think of human personality as a point or small three dimensional object in space and our trajectory for growth as a multidimensional expansion from that point to become a sphere. The point is our small surface personality which has limited knowledge, limited capacity, limited power and limited joy. The sphere is our greater, truer being which is one with the whole universe. It is infinite in knowledge, capacity, power and joy. There are countless ways to move from a point to a sphere. You can make progress by traveling in any direction. But if you focus on only one line of progress, you will end up at the end of a line, not on the surface of the universal sphere. To become universal we have to make progress in multiple directions, simultaneously or successively. Our progress from a point to a sphere is a progress on the dimensions described briefly in this article and explored in greater detail in the Psychology Portal and Spirituality Portal. A comparison between individuals on any of these parameters is of limited value. However, individuals can evaluate themselves on these parameters in order to assess their present position and comprehend the means by which they can further develop at the level of social accomplishment, psychological growth or spiritual progress. This classification is most useful as a means for comparing my relative position in the past and present with what I aspire to be in the future, rather than as a means for comparing myself with others and judging myself inferior or superior in some absolute terms. While these different levels or categories of change can be distinguished from another, they are not entirely separate or independent. Growing psychologically also enhances the capacity for social accomplishment. Progressing spiritually also enhances the capacity for psychological growth. It may also be true that greater social accomplishment increases the readiness for psychological growth and psychological growth may enhance the inclination or receptivity for spiritual progress. So while we speak of them as distinct from one another, we think it is better to recognize their interdependence.